Update (April 17, 2019): NACTO’s Newest Report, Shared Micromobility in the U.S.: 2018, updates these figures with 2017 ridership numbers, including on e-scooter systems. Bike share in the U.S. has continued its brisk growth, with 35 million trips taken in 2017, 25% more than in 2016. This growth is attributable to increasing ridership in existing systems as well as the launch of several major new bike share systems across the country. Since 2010, 123 million trips have been taken on bike share bikes in the U.S.
2017 also saw the advent of a new bike share customer interface, commonly known as dockless bike share. Rollout has been uneven: after a series of unpermitted systems launched (and subsequently closed) in various cities across the U.S., numerous cities responded with pilot programs to permit dockless bike share operations. By the end of 2017, five major dockless bike share companies reported operating in approximately 25 cities and suburbs. The number of bike share companies operating in the U.S. also grew dramatically in 2017. From 2010 to 2016, most U.S. bike share equipment and services were provided by three major companies, B-Cycle, Motivate, and Social Bicycles, with a few cities using equipment and services from smaller companies such as NextBike. As of the end of 2017, five new major dockless companies – Jump (formerly Social Bicycles), Limebike, MoBike, Ofo, and Spin – and a number of smaller companies – e.g., Pace (formerly Zagster), Donkey Republic, VBike, LennyBike, and Riide – opened systems in the U.S. A sixth new major company, BlueGoGo, which was the first to roll out dockless bikeshare bikes in the U.S., declared bankruptcy over the summer. In 2017, the number of bike share bikes in the U.S. more than doubled – from 42,500 bikes at the end of 2016 to about 100,000 bikes by the end of 2017. The majority of the increase in bikes came from new dockless systems. During the second half of 2017, dockless bike share companies introduced around 44,000 bikes in cities across the country. Station-based systems added approximately 14,000 bikes to their fleets, bringing the 2017 total to 54,000 station-based bikes. 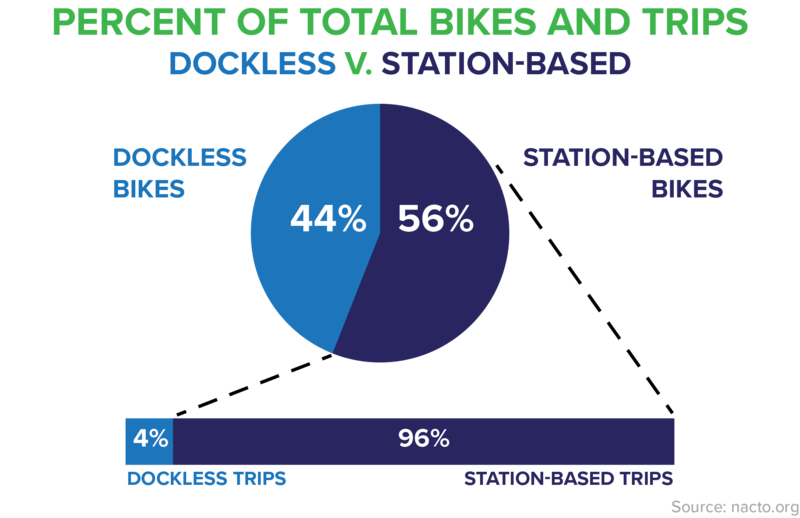 As of the close of 2017, dockless bike share bikes accounted for about 44% of all bike share bikes in the U.S. The large influx of dockless bike share bikes across the U.S. has not yet translated into substantial mobility gains. NACTO estimates that up to 1.4 million trips were made on dockless bike share bikes in the U.S. in 2017, making up about 4% of trips. NACTO’s methodology for counting dockless bike share trips is provided in the Appendix (below). 2017 saw the launch of a number of new station-based systems; notably in Honolulu (Biki), Detroit (MoGo), New Orleans (Blue Bikes), and Charleston (HolySpokes). The San Francisco Bay Area system re-launched as Ford GoBike with 7,000 bikes, a ten-fold increase from the area’s prior system. In addition, dockless companies piloted bikes in approximately 25 cities across the U.S. including Seattle, Washington DC, Dallas, Aurora CO, and Charlotte NC. 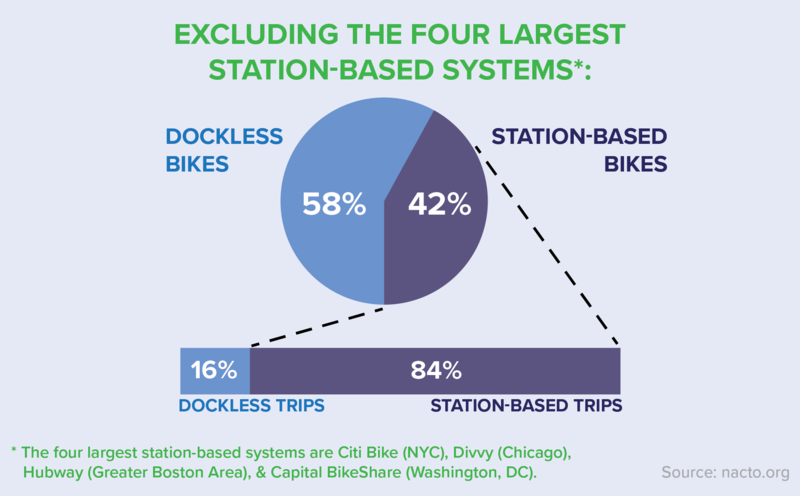 Four large station-based systems – Citi Bike NYC, Divvy, Capital Bikeshare, and Hubway – generated the majority (74%) of all rides taken in the United States in 2017, similar to previous years. 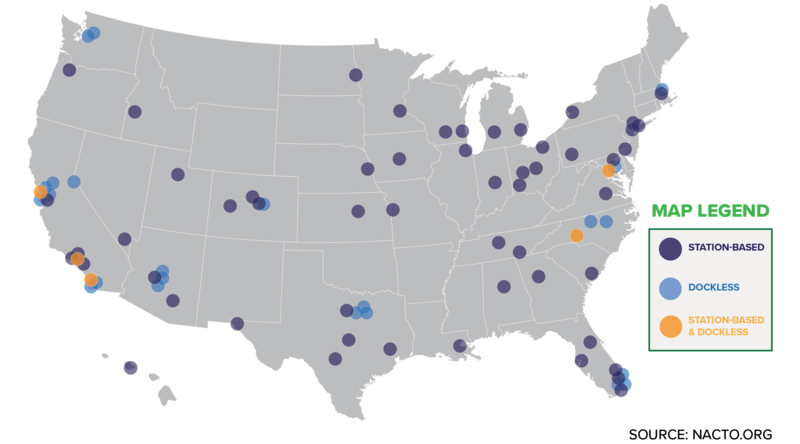 However, bike share growth is widespread across many cities. In Philadelphia, for example, the Indego bike share system increased ridership by 84% over 2016. Several recently-launched systems have attracted substantial numbers of riders. Biki in Honolulu launched in July 2017, and quickly became the eighth-most heavily used bike share system in the U.S., with 365,000 rides taken to date. Detroit’s MoGo system saw 112,000 trips taken in six months, including during some of the lowest November and December temperatures on record. The national increase in ridership also comes from work in cities around the country to make bike share more affordable to a wide cross-section of people. Many of these efforts are documented by the Better Bike Share Partnership. For example, in Philadelphia, work to develop and promote a $5 AccessPass, available to Pennsylvanians receiving food assistance, has resulted in an increase in low-income Philadelphians using the Indego Bike Share system. In 2017, AccessPass sales made up about 15% of all sign ups and AccessPass users took 9% of all trips. Among cities with station-based bike share systems, 32% have an income-based discount program, using income thresholds or living in affordable housing as criteria. This is a 33% increase over 2016 when about a quarter of all cities had income-based discount programs. Newer systems, such as Detroit’s MoGo, have followed this model. MoGo launched with a widely-publicized $5 annual AccessPass, available to Detroiters who receive state food assistance. After six months, AccessPass sales have made up 18% of all long-term pass sales. MoGo also offers a cash payment membership option which is well used by AccessPass holders. Together, the two programs—the AccessPass and cash-option—provide fast, flexible and convenient access to transportation for hundreds of residents. How is Bike Share Used? Understanding who is riding and how bike share is used can be difficult. Most station-based systems collect some demographic data on annual or monthly pass holders but very little on one-time users. Conducting bike share intercept surveys is not yet widespread practice. Dockless bike share companies do not share demographic data, making it hard to get beyond anecdote. In July 2017, the city of Seattle launched a pilot program to allow dockless bike share companies to operate in the city. At the end of 2017, this pilot program included four dockless bike share companies and approximately 9,000 bikes. To accommodate the companies’ concerns about proprietary data and address Washington’s FOIA laws, independent researchers at the University of Washington were employed to gather and analyze the dockless bike share data. To date, the Seattle pilot provides some of the best available data on how dockless bike share is used. In contrast, dockless bike share in Seattle has an evening peak but no morning rush hour peak and trips are spread out over the day with highest use seen on weekends, suggesting more recreational use. 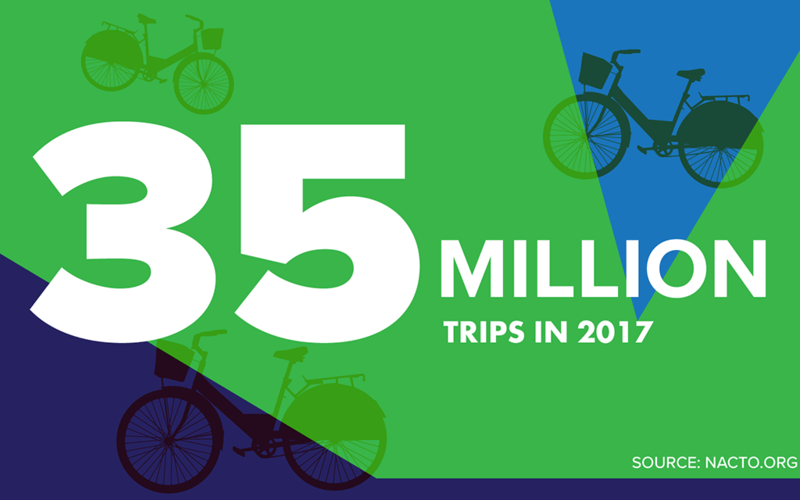 With 35 million trips in 2017 and strong year-on-year growth since 2010, bike share is gaining hold as a transportation option in cities across the U.S. Significant ridership in an ever-widening collection of cities and clear indications of cross-over use between bike share and traditional bus and rail transit indicate that bike share can provide an essential mobility option for people in U.S. cities. The landscape around dockless bike share is less clear. In less than a year of existence, one U.S.-focused company, BlueGoGo, and a number of China-based companies have filed for bankruptcy, merged with other companies, or ceased operations.4 The extreme degree of venture capital funding, coupled with generally low ridership, brings questions as to the overall sustainability and volatility of the dockless bike share market. Cities are proceeding cautiously, watching the results of pilot efforts, and encouraging dockless companies to share more data so that cities can better evaluate and understand how dockless bike share can further city goals of safety, equity, and sustainable mobility. Appendix: What do we know and how do we know it? As in Bike Share in the US: 2010 – 2016, NACTO collected trip data from all publicly available station-based systems with more than 100 bikes or ten stations. Most dockless bike share companies claim their trip data as proprietary. How and what data is shared with cities varies by city and company. There are no comprehensive mechanisms in place to ensure data quality or comparability across markets. As a result, it is difficult to know how many trips have been made or who is riding dockless systems. 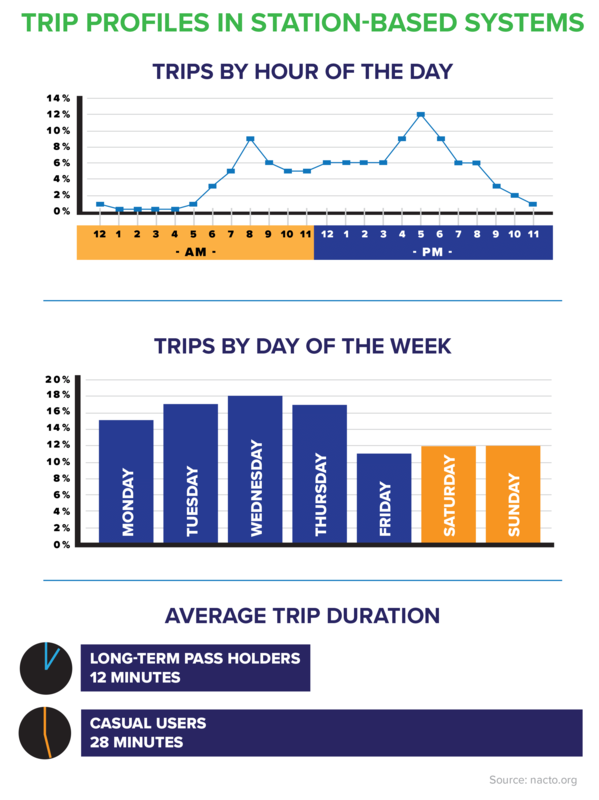 To date, the Seattle pilot, where trip data is compiled and analyzed by independent/third party data analysts at the University of Washington, provides some of the best information about whether dockless bike share is helping to improve mobility and who is benefiting. In developing the estimate, NACTO also assumed two possible average trip lengths to create a “high” and “low” estimate for the total number of dockless bike share trips. The “high” estimate (1.4 million trips) assumes a 1.5 mile average trip length, the average dockless trip length in Seattle as reported by the University of Washington. The “low” estimate (1.1 million trips) assumes a three mile average, on par with how casual or one-time users tend to use bike share in station-based systems.